Buy Disneyland annual passes for 2019. Choose the best annual passport to fit your schedule and budget. If you love visiting Disneyland, these annual passes or passports are the best deal. These will pay for themselves in just a few trips. Disney offers a variety of annual passports with either a one-time payment in full, or a down payment and affordable monthly payments. There are also special passports for Southern California residents. Choose the best annual passport to fit your schedule and budget. 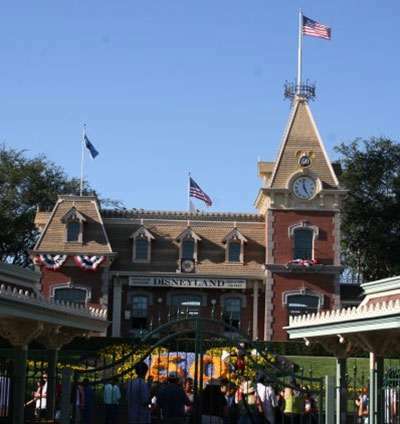 Southern California Annual Pass Disneyland NA NA 215 So Cal residents only. Offer not currently available except for renewals. To be eligible for the monthly payment option, you must reside in Southern California in zip codes 90000 to 96199. To be eligible for the Southern California and Southern California Select Disneyland annual passes, you must live in zip codes 90000 to 93599. If you buy Disneyland annual passes, it is important to know the Disneyland blockout dates. These are dates that you may not visit Disneyland using your annual passport. Disney Signature Plus annual passport holders have no blockout dates. They may visit Disneyland every day of the year, including popular Christmas and New years holidays! Disney Signature annual passport holders have 15 blockout dates during the popular Christmas and New Years holidays. Annual passport users may visit Disneyland all other days of the year, including summer and other holidays! Deluxe annual pass holders have 50 blockout days per year. These are very popular crowded days at Disneyland such as President's Day weekend in February, Easter or spring break weekends in March or April, Saturdays during spring and summer, Memorial Day weekend in May, July 4th weekend in July, Labor day weekend in September, Thanksgiving weekend in November, and Christmas and New Years time in December. For a detailed Disneyland blockout date calendar for Deluxe passes, see disneyland.disney.go.com. You never know who you will see when you visit Disneyland. 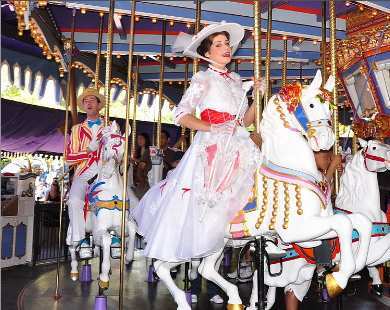 Disney Grandpa got this great photo of Mary Poppins riding the carousel. Southern California annual passport is restricted to So Cal residents and has 140 blockout days per year. It is not good on Saturdays, popular weeks during the summer, most holiday weekends and popular breaks such as spring break and winter break. This Disneyland annual pass is good on most Sundays, making it a good choice for locals who work during the week or have kids in school. This is a great deal, but it is not always offered. For Southern California Disneyland blockout dates see disneyland.disney.go.com. Southern California Select annual passport is restricted to So Cal residents and is the most restrictive of all the annual passes, with 195 blockout days per year. It is not good on Saturdays or Sundays, or most of the summer and holiday weekends and school breaks. This is the perfect pass for those who can visit Disneyland on all those days when most kids are in school. For Southern California Select Disneyland blockout dates see disneyland.disney.go.com.